From the Requirements module, you can create and view your requirements. With Justinmind Enterprise, you can define and manage all of your Justinmind requirements. This section contains all default requirements fields. Here you can apply filters to view specific requirements (e.g. by Type, Related Component or Source). You can customize requirement fields (including With Justinmind Enterprise, you can define and manage all of your Justinmind requirements) here. The Requirements Details palette displays all of the information related to the selected requirement. Here you can modify information related to the selected requirement, such as the Author, Name, Type, Source, and Description. New version – creates a new version of the selected requirement with the new information introduced. Click the “New Requirement” icon in the toolbar. In the dialog that appears, fill in the details of your requirement (e.g. Author, Name, Type and Source). Then click “OK”. The requirement that you have just created will now appear in the list of requirements. Go to the User Interface module and select the UI element in the canvas that you wish to associate a requirement to. Right click on the element and select “New Requirement”. As above, fill in the details of your requirement. When you have created your requirement, a clipboard icon will appear at the top left-hand corner of the element in the canvas. You can associate a requirement to more than one UI element. To do so, simply drag and drop the requirement from the requirements palette to the element(s) in the canvas. Category – click to select a category. See “Requirement categories” below for more information. Delete – delete the selected details in the list. Note that you can only delete one detail at a time. 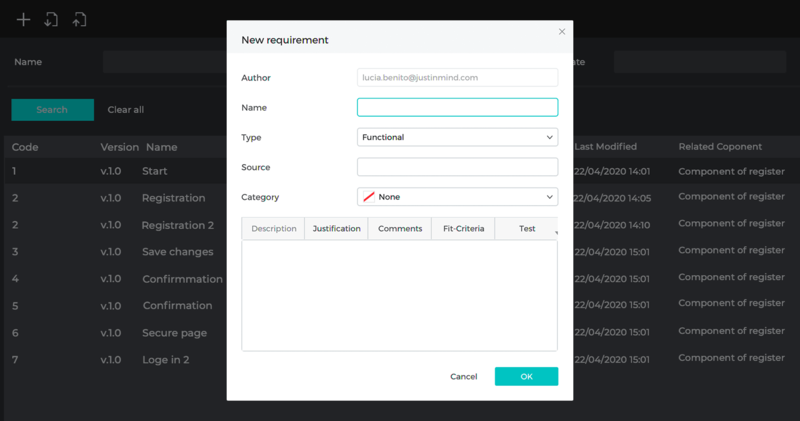 In addition to the default requirements fields, you can create an unlimited number of additional requirements fields and customize them as required for your prototype. Go to the “Requirements configuration”, from the “Justinmind” main menu option for Mac or “File” for Windows. At the bottom of the dialog that appears, click the “Edit Custom Fields” link. 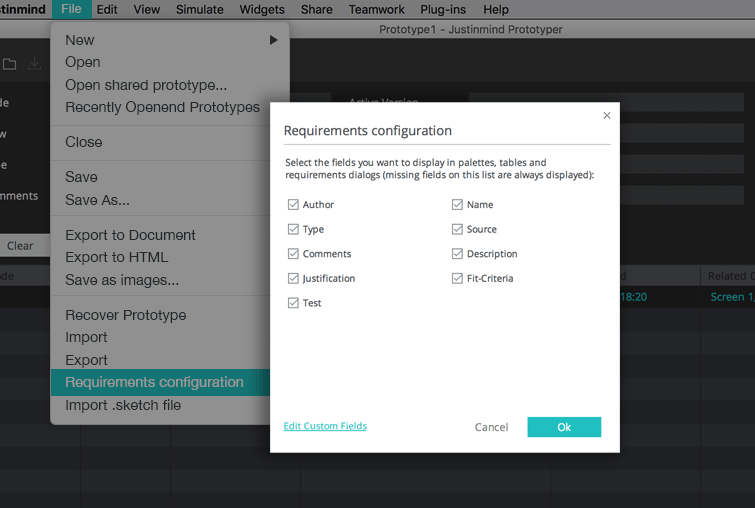 Click “Add Custom Field” to create an additional requirements field to your prototype. You can add, rename, hide or delete them as necessary. However, you won’t be able to hide default fields with this option. Click “OK”. Back in the “Requirements configuration” dialog, you’ll see your new requirements field appear. Select “Preferences” from the “Justinmind” main menu option for Mac or “File” for Windows. 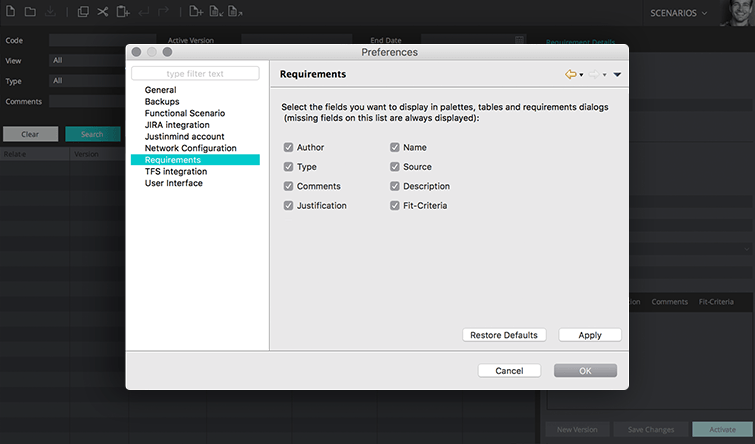 In the dialog that appears, go to “Requirements”. Here you can add an unlimited number of additional requirements fields, as well as rename, hide or delete them. With this option, you can also hide default fields for all prototypes. You can always unhide hidden fields by returning to the “Requirements configuration” dialog. Note that you cannot delete default fields.